November | 2014 | Read.Write.Discuss.Repeat. The Edit VS Man Flu. It does annoy me that I don’t get to see my Sister, Brother in law and wild Nephew more often. But they would have to live in Sheffield wouldn’t they? No, Sheffield’s lovely and it’s their home. I just never seem to be able to get time off to sort something out. So when I heard they were coming to visit my parents and I could go up and see them that I was delighted. Awesome! I get to see them. Maybe wild Nephew won’t give me that ‘Who are you?’ look this time? Nah. Of course he did. But I got to spend time with him so it’s all good. It’s great to see how grown up he is. And once he and his parents had left to go back to Sheff-side I waved them goodbye thinking I wouldn’t see them again until Christmas. But oh no, I wasn’t that lucky. Because you see the wild Nephew, I’m sure it was him, left part him with me and my parents before he left. The cold and flu part more popularly known as the dreaded Man Flu. Now, I went to visit my parents this past weekend hoping that the aches I had been experiencing in the week prior would go away. That it was all a result of the exercise I’d been doing for the three days back to back previously. But alas no. As I prepared to go on the Saturday I had gotten worse. And my parents had also gotten the bug. So we all spent the weekend feeling ill together as a family. Togetherness and all that. Then, Monday comes around. ‘I’m okay to go into work.’ I say. ‘No you’re not you idiot’ says my body and head CLEARLY. I didn’t listen. Went in work, had an awful, yet surprisingly productive, day. Got home. Went to bed. Had Tuesday off work to recover. Went in today feeling a lot better but was late because I thought I’d left the water running. Which I hadn’t done. Because I’ve never done that. This now means I owe 1 hour back to my employer. And this all means that I missed a few priceless days of editing. Lovely to have you read a post of mine as always. Good Bye! Always a pleasure to share a good blog post from an excellent blogger. As you can see from the photos and the title, I’ve gone all Monty Python & The Quest For The Holy Grail over this post. If you haven’t seen it, I still think that it holds up in this day and age for classy yet hilarious humour. It is the most quotable movie I know and I love so many of the scenes from it. In fact, it was hard to choose some scenes to fit into a writing theme as so many worked well! So, as I’ve mentioned before I’m editing a story for the month of November and it’s moving along steadily. I have been doing NaNoWriMo for the past two years but I fancied a change. As the edit has gone on I’ve picked up on a few things that will need researching and looking into in future. I’ve made a note of these things and they just so happen to be very important to the overall story. I’m considering doing an editing month for December more and more. Well, December through to January as December has a couple of birthday’s and Christmas parties that require my attendance. The research will cover my lead characters sister and her involvement in the whole thing and how the searcher general came to find the recipe for immortality. I’m about 2/3 of the way with the immortality back story and about half way with the sister back story. Hopefully by the end of the edit I’ll have a better idea of what I had planned for her. I have also found that I may or may not have been trying to come up with my own language whilst writing the first draft of my human vs demon yarn, The Searcher’s Want. Some of the sentences, and paragraphs for that matter, just didn’t seem to make any sense. I’m being as ruthless as I can be and have deleted plenty of full sentences but I came across one paragraph and I could not stop frowning. What the hell is that? I found myself going back over the last paragraph or two to see what would make sense. It’s sorted now. Until the next edit anyway. Anyway, I’m going to get back to it. Have a good week. Oh editing, how I love and hate thee so. It’s coming along nicely. I’m sticking to my schedule and I’ve now, just this morning in fact, finished editing Chapter 11. I’m going to start Chapter 12 later today. I gave myself the goal of editing half a chapter each time I sat down to edit and, though I thought it would be a little bit too much, it’s turned out to be a manageable amount. I don’t feel overwhelmed at how much I’ve got to edit by the end of the month as the bite sized chunks I’ve concocted are just right. I am glad I’ve not changed my mind over this as I’m very happy with the world I’ve created within my story. Part of me thought I’d throw it all away. Maybe I still will. But I’m going to try and not think about that for now. Possibly. Even though I am enjoying the edit so far, sometimes I wonder what I’m on about. By that I mean, some lines I’ve come across that I’ve written some two years ago make no actual sense to anything on this earth. Some of them looked to be the sentence equivalent of a Magic Eye picture but the opposite way round. From a distance it looks like a normal sentence, all making sense and such. But as you get closer, you realise that it’s complete rubbish! Why did I write those words in that random order in the first place? It does give me a test though, which is to try and figure out what the line should be (for now) so it fits in with everything around it. Thankfully it didn’t take me too long but I was scratching my head for a while. That’s what editing all about right? Ok. I’m off to edit some more. 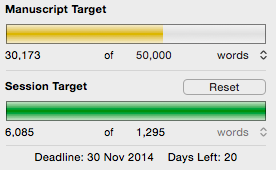 I hope you all have a good week and if you’re taking part in NaNoWriMo this year that you’re on target.